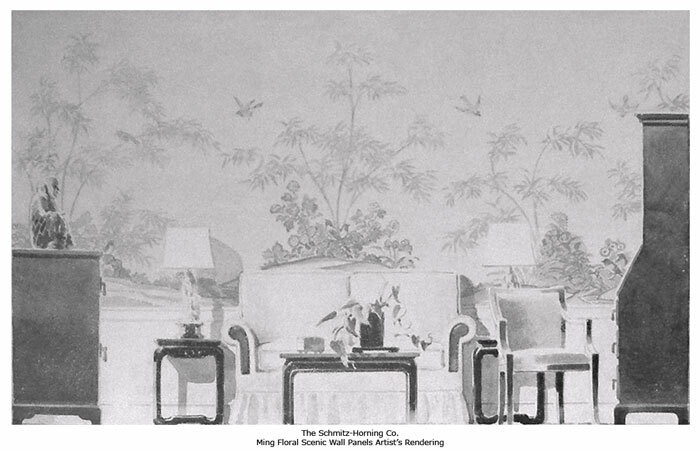 Schmitz-Horning Co. “Ming Floral” Scenic Wallpaper (Artist’s Rendering). Recently, I was contacted by someone online who asked if I knew anything about the Schmitz-Horning Company’s “Ming Floral” wallpaper pattern. They stated that their grandfather was a painter/wallpaperer in the 1930s through ’60s, and that he had saved three panels of the wallpaper. I know the pattern, a lovely one — we had it in a bedroom at our family home where I grew up in Cleveland Heights, Ohio. The house originally belonged to my grandfather, Warren R. Schmitz, who ran the company after my great-grandfather’s (Hugo M. Schmitz) death in 1938. Schmitz-Horning Co. “Ming Floral” Scenic Wallpaper Panels. The Cleveland-based company employed and contracted with many Cleveland area artists, and I believe that artists/illustrators were used from England and that the paper was distributed there as well. The papers were printed using presses capable of oversized printing, the only of their kind in the country at the time. High quality oil-based inks were used on sturdy paper, that enabled the papers to be washed and to retain colors. The company did art murals/wall scenes or friezes that were tastefully designed but affordable, and later scenics and continuous panoramics that surrounded a room were available for homes and public buildings. A patent was filed in 1906 for the printed frieze for walls by Hugo M. Schmitz, his business partner William Horning, and his top salesman, Warren R. Cox. An article he wrote was published in an architectural decorating magazine at the turn of the century about the friezes. He was an artist himself and designed some of the paper. On the Smithsonian Cooper-Hewitt, National Design Museum web site, scenic panel, “Ming Floral,” is a 1939 chromolithograph, but they are in the process of digitizing images of S-H wallpaper (gifts of the Wallpaper Council, Inc.). According to a 1950 S-H Scenic Paper price list, Ming Floral was available in white, pale yellow, gray, and turquoise. A full set of four panels was $30.00, and price per section was $8.50. In another, perhaps earlier catalog, it was priced $7.50. Each panel was 40″ x 80″ in size. The panels contained imagery of plants, flowers, birds, bamboo trees, and turf. It was from an original hand-painted Chinese design. Copyright article and images. All rights reserved. Not to be used without permission.